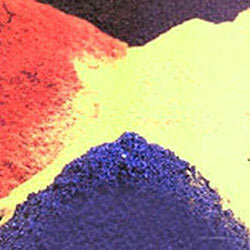 Leading Manufacturer of bifunctional reactive dyes and bifunctional reactive dye from Ahmedabad. Bifunctional Reactive Dyes are grouped in each dye-molecule. These are of bi-reactive group (VS/MCT). In common practice this is to use other family of reactive dyes in printing although this fulfil the task and advantages associated with this phenomenon. Looking for Bifunctional Reactive Dyes ?